Finished the last book in this trilogy earlier this evening. I enjoyed the ramped up action of this novel. Lots happening as avatars from throughout the Egyptian pantheon drew together. Some were old hands at channeling a ancient god; some were novices and some were not just novices, but folks who had never given a thought to the true existence of this ancient array of gods and goddesses. The tension grows as all the threads of Nicole's life come together in one spectacular battle of good against evil. Casualties are had and victories are won and lost. Fun, edge of the seat reading. Kudos, H.L. !So now I'll switch gears a little. Not out of the fantasy world, just onto another series. I've been hoarding Jim Butcher's new Dresden Files, "Cold Days," since it's release. I think I'll take a day to digest -- then on to read another fun and fantastic story! 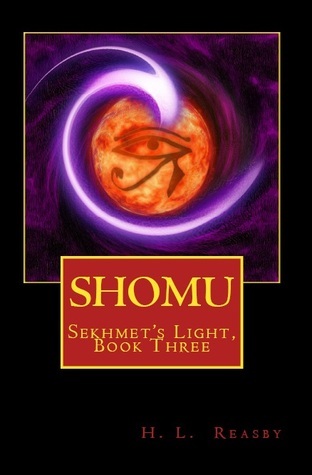 I really enjoyed this concluding novel to the "Sekhmet's Light" series. While shorter than the other two novels, it never slowed down and just kept one caught up in the action. I only put it down because I couldn't keep my eyes open any longer (Bah! Why do we have to sleep!)! I would love to see other books with the same theme.I also really enjoyed the short story at the end of the novel. It gave a nice taste of the beginnings of NuruSekhmet. I would also like more stories set in this time period! Oh man! What a wild ride! I absolutely loved this trilogy. Definately one of my faves and destined to be on my shelf forever. I would recommend these books to every and anyone. I will be following this author to scoop up everything she writes! Wonderful! H.L. Reasby - Though born in Illinois, Heather spent most of her life in the Phoenix/Scottsdale metropolitan area of Arizona. Now residing in the beautiful Pacific Northwest (literally moving from one extreme to the another) she is married to Garth Patrick Reasby, who is a talented artist and writer in his own right.